Island Oyster is a one-of-a-kind summer destination in New York City that was recently nominated for a James Beard Foundation 2019 award for Best Restaurant Design. Featuring easygoing summer fare, a tropically inspired cocktail program and panoramic views of New York Harbor and downtown Manhattan, Island Oyster offers "a true island experience" (CNN). It's "a sight worth leaving Manhattan to see" (Vogue). Governors Island is reached by a 5 minute Ferry ride. Ferries depart Manhattan from 10 South Street and Brooklyn from Pier 6. Click here to see the current ferry schedule. Island Oyster accepts a limited number of reservations per day for parties of up to 12 guests. We operate primarily as a walk-in restaurant, reserving the majority of our tables for walk-in guests. In the event that you are unable to make a reservation, we encourage you to join us anyway. We'll be happy to seat you on a first-come, first-served basis. Should you need to modify or cancel your reservation, please do so via Open Table using the link in your confirmation email. In the event of a missed reservation without prior cancellation, a fee of $25 per guest will apply. All cancelation fees are donated to the 501(c)3 Maritime Foundation. Half dozen Navy Point oysters dressed with shishito, cucumber and Champagne mignonette. Debragga and Spitler certified Angus Beef hanger and brisket burger, muenster cheese, tomato, Bibb lettuce and gochuchang aïoli on a griddled potato roll. Island Oyster is located on Governors Island, a five-minute ferry ride from downtown Manhattan (everyday) or Brooklyn (Saturday and Sunday only). 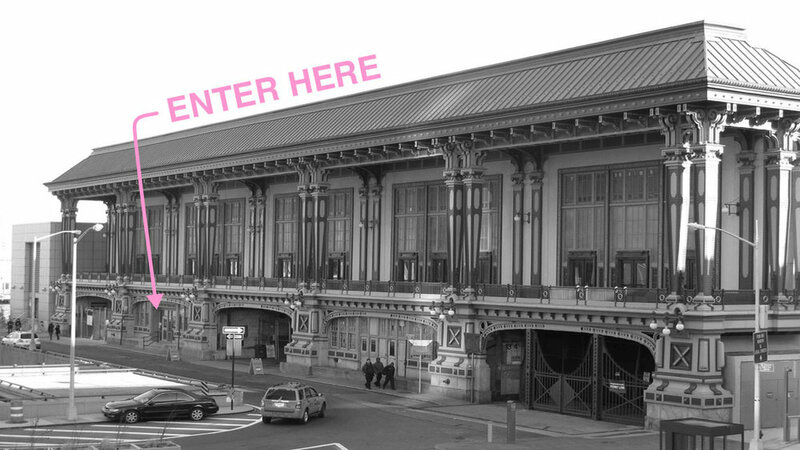 From Manhattan: Make your way to the historic Battery Maritime Building at 10 South Street. The building is just to the northeast of the Staten Island Ferry Terminal. Walk inside, purchase a $2 ferry ticket, and the staff will direct you to board the ferry. Ferries depart for Governors Island starting at 10 am and run on the hour during the week and every half hour on weekends. Click here for a complete ferry schedule. From Brooklyn (Saturdays and Sundays only): Make your way to Pier 6 in Brooklyn Bridge Park, at the intersection where Atlantic Avenue dead-ends into the East River. The ferry landing is on the south end of the pier. Purchase a $2 ferry ticket and board the ferry. Ferries depart for Governors Island starting at 11 am and run on a variable time schedule. Click here for a complete ferry schedule. Exit the ferry, take an immediate right, and walk along the water. You'll run right into us. 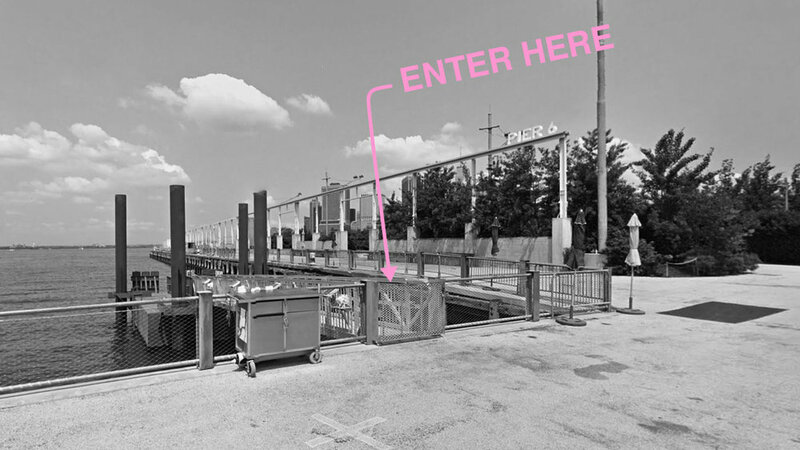 There are three ferry landings on Governors Island, but no matter which you arrive at, we will be on your right. Most people will arrive at Soissons Landing (A.) which is adjacent to Island Oyster. Just take an immediate right when you hit land and you'll see us. Smaller ferries make drop offs at Pier 101 (B.) and Yankee Ferry Terminal (C.). In any event, just walk off the ferry, take an immediate right when you exit, and walk forward along the water. You will run right into us. ISLAND OYSTER is AN UNRIVALED DESTINATION FOR COCKTAIL PARTIES, CULTURAL EVENTS AND WEDDINGS. Please give us a bit of information about your event goals and we will follow up promptly. We would love to hear from you. Send us a note and we'll follow up shortly.